So, life update: in August I was gifted an Aero Press coffee maker that has, by no stretch of the imagination, revolutionized my coffee consumption. I admittedly have been going out for coffee much less frequently, which has saved me a ridiculous amount of money over the past few weeks. From now on, I want to use THE GRIND series as a way to encourage you (and myself) to break out of your routine, to treat yourself, and go discover new places to feed your caffeine addiction. I first ventured into Happy Bones NYC about two years ago, and even though I don’t stop in frequently, I always enjoy it when I do. Earlier this week I went on a coffee date there with The Post Grad Blog founder and my co-editor Ashley, and I was almost immediately reminded why I like it so much. 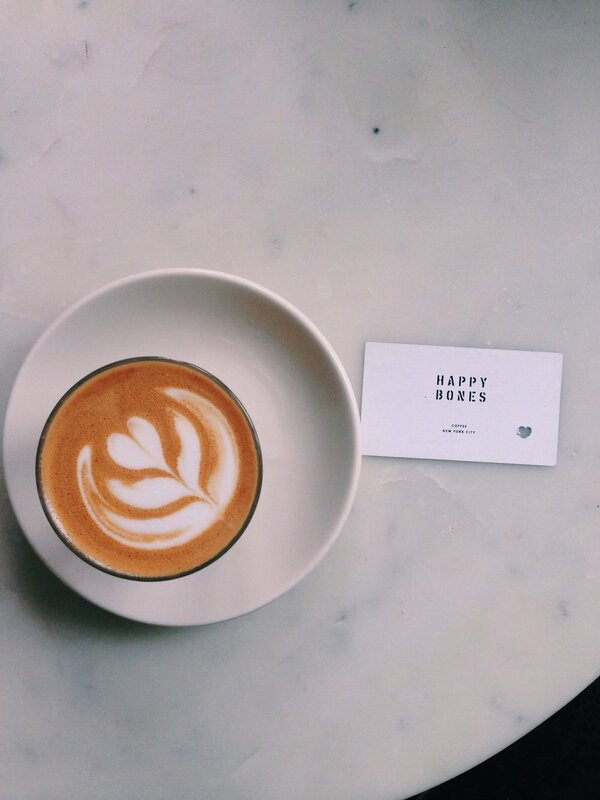 Happy Bones was started by a group of New Zealanders who brought their local coffee culture with them when they all relocated to New York. Their espresso drinks, made with Counter Culture Coffee’s Ethiopian roast, are tart and full of flavor. And are brewed with a La Marzocco, which I have heard is referred to as the Lamborghini of espresso machines. When you first enter into the small storefront you’re struck by the stark whitewashed bricks, the angular shelves behind the counter, and the three small white marble tables lining the left side of the shop. It’s a very organized, clean, and aesthetically modern space that is very photogenic to people who like taking photos of their coffees before they drink it (including me and Ashley). If need something to read while you nurse your coffee, they have a stack of back-issues from the indie publications Kinfolk and Inventory. I’m unsure about where the name for the shop comes from, but they do have a pattern of dog bones on their coffee cups and sometimes punch your loyalty card with a bone-shaped hole punch. Definitely check out Happy Bones if you’re ever in the neighborhood. It’s a cozy place to grab coffee with a friend on a rainy day. If you have any suggestions for cafés, please email us at thepostgraduate17@gmail.com ! We are always looking for new experiences and would love your input. Stay tuned for more!